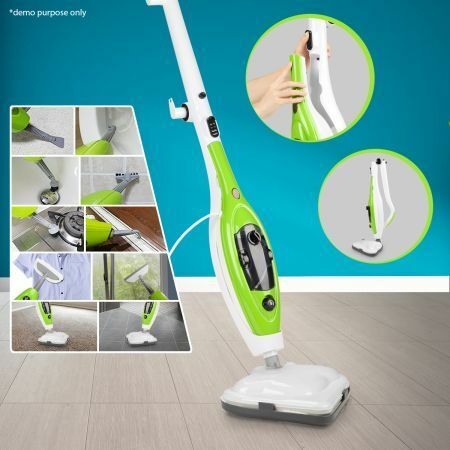 Show your dirty floor who's the boss with this 10 In 1 Foldable Steam Mop! You name it, this mop will clean it: marble, stone, tile, parquet, linoleum, ceramic, hardwood and even garments. It truly is the ultimate in multi-floor cleaning product! This steam mop is a cleaner's dream. 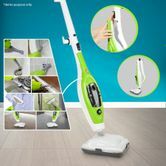 Ready in just 10 seconds, the steam power in this mop will blast away dirt, grime, dust and household bacteria. The built-in steam cleaner improves manoeuvrability. With the triangle-head steamer, every corner, crook, curve and nook-and-cranny in your home will be thoroughly cleaned. Easy to carry, fold, and handle, it'll save your body the usual aches and pains associated with mopping all while saving you cash too. Mopping doesn't have to be such a chore - get it done swiftly & comfortably and go on with your day! Give all the rooms in your home a sparkling cleaning with this wonderfully convenient 10 In 1 Foldable Steam Mop! Includes multi-function accessories for cleaning from hardwood floors to steaming garments!